If you have a girl within 40 miles of your home you no doubt are familiar with Hannah Montana. If you can get past the first 6:30 minutes of girl talk. Miley and her best friend Mandy do a great job of expressing their faith. In a culture that is desperate for positive role models. I have to admit I am a Hannah Montana fan. I just got off the phone with Pastor Rafael Riera. They will be starting Sunday services this week at the Beef O'Bradys in Four Corners. I am so impressed with Rafael and his passion and expertise. He has a great plan in place and is already receiving lots of attention from the Spanish speaking community of Four Corners. Their Sunday school will start at 9:30 and Worship is at 10:30 a.m. I am asking all of our Cornerstone people to raise this church and this pastor up in prayer as they launch out this weekend. Also, I want to say how much I appreciate Mary Ann Owens and the team at Beefs for making their restaurant a sanctuary for church planting. It is obvious how much she loves our God. I guess the Bible is all in how you look at it. Like a diamond, its beauty is discovered by the many angles and how the Light is reflected through each. Consider the you genre-atical approach the next time you pick up the leather bound book. Hello Everyone, Thank you for praying for our Easter Services. First, I want to thank all of our volunteers who worked to make this our best easter ever. Without your hard work it would have been a very difficult day. Second, I want to thank all of our regulars who got tickets and bathed the day in prayer. God answered those prayers. Finally I want to thank our guests for coming out and worshiping with us. The family of God is an amazing thing and total strangers can seem like life long friends in no time. We finished the day with several folks accepting Christ as Savior, and 344 in attendance. This is more that we could have imagined and we give God all the glory. I will do what I can to upload some Easter pictures over the next few days. 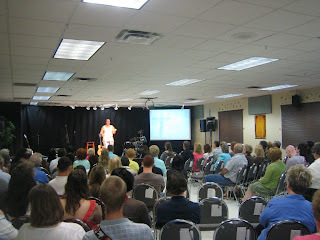 Here is a picture Terry Miles took during the third service. I also just returned from the hospital and Mrs. Pauline and Eulin Francis are doing well. Also, Nita, our guest that was taken by ambulance (Chest pain) is still being checked by the E.R. but she is doing much better and wanted to thank everyone for their prayers.